A revolutionary and safe treatment in combating all forms of hair related problems for both men and women. Hair loss is something that can occur in both men and women as a result of genes, stress, or changing hormone levels, and can really affect a person's confidence and happiness. Around 10 million men and 8 million women suffer from significant hair loss in the UK, and many of us feel concerned when we seem to be shedding too many hairs during washing or combing. The HairMax LaserComb uses laser diode technology to improve hair growth, reduce hair loss and improve the hair's condition making it appear fuller, thicker and healthier. This is the Advanced 7 Laser Comb which features 7 individual laser beams to stimulate the hair follicles and encourage growth. Of course, individual results may vary, but within the first 12-16 weeks you will notice early general improvements or activation of scalp hair occurring. These improvements include a normalising of scalp condition; thicker and shinier hair; and, not forgetting, a boost in your confidence. Every single hair on our scalp grows from an individual follicle, and each follicle has its own growth cycle. The first is the growth stage and can last between two and six years. Next is the transitional stage where the follicle shrinks and the blood vessel feeding it begins to cut off its supply. This takes the follicle into the final resting stage, where the hair does not grow any more but remains attached. Since there is no blood supply during this stage the follicle is weaker and the hair is easier to pull out. Normally around 85% of our hair follicles are in the growth phase at once, which is why we can have a full, thick head of hair despite some hair not growing. Hair loss can occur when unusually larger numbers of hair follicles are in the resting stage at one time. How does the HairMax Laser Comb work? 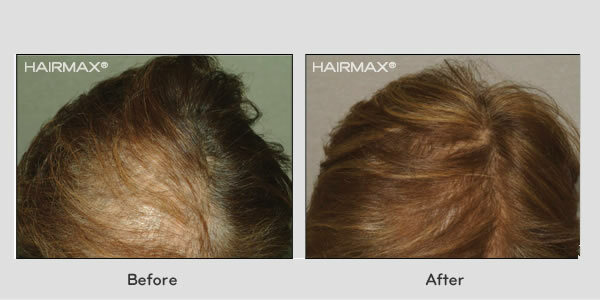 The HairMax Laser Comb can thicken and strengthen hair through the scientific principle of “Photo-Biostimulation”. Lasers stimulate the follicles and encourage blood flow, which prevents the follicle from going into the resting stage. More hair therefore continues to grow and is far healthier and stronger than it would be in the resting stage. Laser therapy works because it is an intense beam of light directed onto the skin which encourages the production of ATP, the basic energy source for all cells. The more ATP a cell has the better it can function, which is why when lasers are applied to follicle cells they have better blood flow and are healthy enough to hold onto their hair. Through extensive clinical research, the exact wavelength and energy level that is most beneficial in stimulating weakened hair follicles has been determined and is delivered by the HairMax LaserComb Advanced 7, and clinical studies have found that 93% of users achieved fuller, thicker and healthier hair within 16 weeks. The HairMax Laser Comb is an excellent alternative to harsh medication which can have severe side affects, and it is far less time consuming and less invasive than hair transplant operations. For the best results you only have to use the Advanced 7 for 15 minutes three times per week. The Laser Comb is powered by four AA batteries (included) so that you don't have to struggle with power cords as you make sure to get even coverage across your whole head. To use the comb simply gently drag it through your hair, allowing the teeth to part your hair so that the laser comes into direct contact with your scalp. If you have particularly long hair it is best to use your fingers or a comb to lift the hair to help this process. Hold the comb on one area for a few seconds, then move it a few centimetres to the next section of scalp. This Laser Comb model has a vibration function to tell you when to move the comb. Start from the hairline on the top of you head and slowly move the comb over your whole scalp to the top of the neck. Then do the same from above your ear at one side of your head and slowly move it across to the other side. This way you should allow the laser beam to come into contact with the entire scalp. If you keep up with the Laser Comb treatment regularly you will begin to see results within 12 to 16 weeks. Don't just suffer in silence from hair loss; get your confidence back with the simple, painless and effective treatment of HairMax Laser Comb. Read our Short Guide To Hair Loss Remedies on the StressNoMore blog.